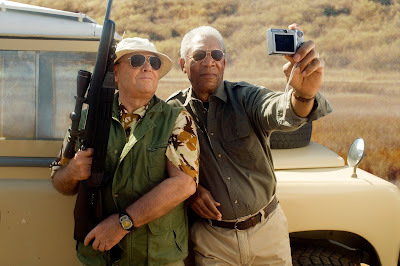 The Bucket List is a cliche-ridden movie that is elevated by the casting of Jack Nicholson and Morgan Freeman. Seeing these two veterans bring different colors to this retread of Grumpy Old Men is one of the few things to recommend about this film. It's unfortunate, too. The concept of trying to complete everything on your list of things to do before you kick the bucket is intriguing. But one keeps hoping for a twist to stave off the pervasive predictability of the plot. When given a choice, the once promising comic director, Rob Reiner, never ventures into the more interesting of two dramatic choices presented to him. For instance, Nicholson's Donald Trump-like character might have seemed like an interesting counterpoint to the middle-class character Freeman portrays. But how much more interesting would the story have been if,in addition to the ticking clock of the two's terminal cancer diagnoses, the pair were also challenged by a lack of funds to achieve their dreams. Would the two be desperate enough to lie, cheat or steal to fulfill their life's goals? Reiner shies away from anything remotely holding dramatic interest. This is the type of film in which, when Freeman convinces Nicholson to mend fences with his estranged daughter, the dialogue fades away leaving trite sentimental music to play over the scene instead. Wouldn't it be more interesting to give a serious dramatic actor like Nicholson something substantial to sink his teeth into? Reiner has directed Nicholson to an Oscar Nomination before (for A Few Good Men). So instead of relying on Reiner, we must rely on his two wonderful actors to enhance the story. Freeman has the more difficult job, standing in for the audience as he plays straight man to Nicholson's antics. But he has a great scene, where winding down from a round-the-world trip with Nicholson in a Hong Kong bar, he meets a beautiful woman who proposes a tryst after hearing his account of a visit to a Himalayan peak. Having never slept with anyone other than his wife, Freeman's eyes betray how tempting the offer truly is to the character. But he nobly and predictably turns it down. This despite the fact that he earlier admitted to Nicholson that his dull marriage is one of the motives he has for taking this trip with the billionaire. One wishes the film would have been brave enough to show Freeman take the woman up on her offer. Nicholson steps up in the latter part of the film, after Freeman's condition worsens. Conscious of his friend's deeper appreciation for life, he starts to appreciate that material pleasures aren't always what they're cracked up to be. A bittersweet visit between the two segues into uproarious laughter, after Freeman educates Nicholson on the exact, repulsive way that the rare coffee he drinks is brewed. It is a moment that these two master actors elevate beyond its cliche roots. Maybe the film's premise, rooted in mortality, was judged to be depressing enough as it is. But an interesting and potentially darkly comic take on terminal patients was creeping around on the fringes of this story. The Bucket List would have marked a strong departure for Reiner, and would have benefited greatly from Nicholson and Freeman's dramatic chops, had he opted to stretch beyond his limited storyline.